Early in 2012, I completed a study for the GSM Association (GSMA) on the topic of new business models that would be linked to innovative, connected-device applications. This study laid out a sequence of value propositions, as companies seek to move up the value chain. In order to bring these new value propositions to market, new and innovative business models would need to be designed. In the early days of M2M, the value proposition was all about connectivity. This would make stand-alone devices ‘smart’ and the business challenge was largely about how connectivity could be ‘embedded’ inexpensively. Later on, the market evolved as companies started to care about deployment, reliability and the user-experience issues. This ushered in a new value proposition around managed connectivity and several specialist platform providers have emerged in their own right or as partners to mobile operators. The final two sources of value that were identified included the delivery of ‘platform innovator’ and ‘stewardship’ services. 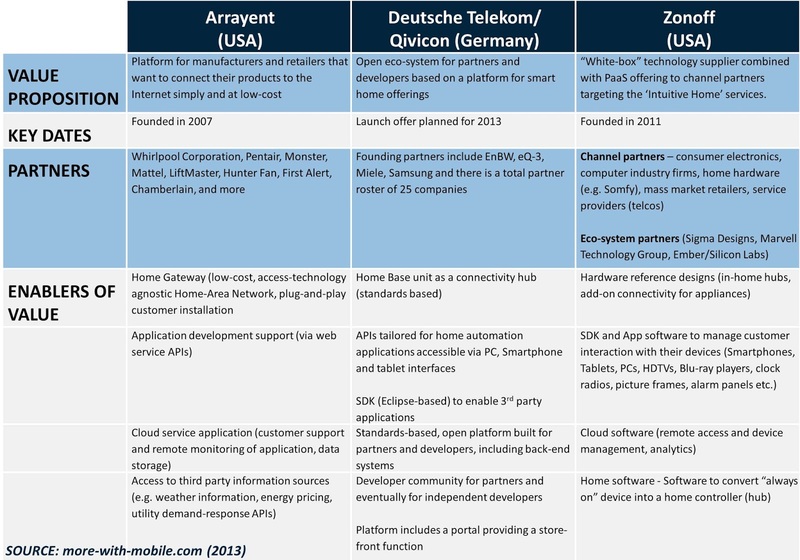 The connected devices market has been moving in these directions with three companies – Arrayent, Deutsche Telekom’s Qivicon and Zonoff – investing their energies in the platforms arena. M2M connectivity is typically considered to be a low revenue, but potentially high margin, business if well executed. It can be a perfectly adequate strategy for connectivity providers that aim to be efficient, low-cost data carriers. Most companies, however, are interested in offering higher value services to offset the competitive pressures that erode pricing. In the connected devices arena, the following illustration demonstrates the likely evolution of company strategies up the value stack, beginning with basic- and managed-connectivity. Stewardship services would apply in situations where a service provider, such as a mobile operator, has responsibility for providing a variety of communications and non-communications services to an end user. A simple illustration might involve a mobile operator that has visibility of a homeowner’s energy consumption patterns and uses that data to negotiate a better utility service contract for the homeowner, from one year to the next. In the case of the Platform Innovator model, a mobile operator could establish an open platform that allows a variety of devices, from different manufacturers, to be connected to manufacturer back-end systems. In the case of a smart home, the platform would allow different household appliances to be reached via the Internet and for the data from these appliances to be supplied to the appliance vendors as a means of supporting a variety of different applications. A refrigerator manufacturer, for example, might benefit from such a platform to provide alerts to the homeowner (e.g. unusual patterns of use or energy consumption) or to provide reminders about when it is time to replace the water filter. The benefit of the open platform is that it avoids each appliance vendor having to build and deploy its own smart-connectivity solution. For the homeowner, there is only a need to deal with a single interface and not to have to manage a different remote control application for each and every appliance. The value migration illustration shows a possible transition between Stewardship and Platform Innovator stages. This is because there is a degree of commonality with the underlying capabilities necessary to offer the respective services. A Stewardship strategy could ultimately lead to a Platform Innovator one and vice versa. To date, there has been little evidence of companies progressing in the area of Stewardship Services. The Platform Innovator path, however, is being tested by several companies, three of which are profiled below. Each of these initiatives follows a common pattern in terms of the component offerings that create value. The basic building blocks consist of: a home-hub; cloud-based device- and application-management services; and, support for PC/Smartphone/Tablet Apps to handle user interaction with their home environment and connected devices. There is recognition in each of the above initiatives as to the limitations of a pure-technology proposition. In other words, the platform providers have to make an effort to crystallize the smart home market by bringing on-board appliance vendors and also by orchestrating different parts of the eco-system (developer community, design guidance and tools etc.). In particular, it is important to assist appliance vendors and service providers, which typically lack the necessary communications sector expertise, to develop innovative applications. For example, in addition to application development support services, Arrayent, provides weather information. It also provides access to utility-company, demand-response applications. These capabilities can inspire more complex applications to differentiate from ‘vanilla’ forms of remote monitoring and control. In the case of Qivicon, it plans to support a community for independent developers as well as a store-front portal which can only help to drive critical mass and lower the barriers to adoption. 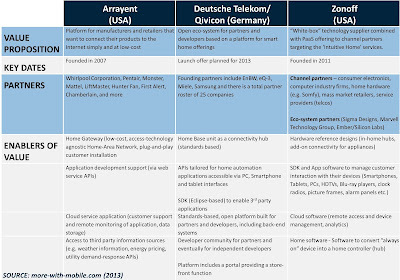 The genesis of each of the three initiatives is also different – Arrayent (platform), Qivicon (wide-area communications to homes) and Zonoff (wireless technology portfolio) – as are the strategies and business models being deployed. What these developments do show, however, is that new business opportunities are opening up as the connected devices market matures. This provides considerable food for thought to those mobile operators that are initiating Connected Home initiatives. It is also clear that these types of initiative depend on strategic and corporate commitment. They also have a lead time measured in years, not months, as evidenced by the progress of AT&T’s Digital Life and Deutsche Telekom’s Qivicon efforts. One closing observation is that, for now, the most prominent platform innovators are centered in the home market segment. As I have previously written here, however, there are other promising opportunities for service providers with broader ambitions and a belief in other segments of the Internet of Things market. Verizon pulls the plug on its smart home service offering - 3 years after launch. Bosch and Siemens launch a 'home-connect' platform to manage appliances from different vendors. Samsung sees value in the platform innovator strategy which also has the potential to increase the value of its own device and appliance offerings. MOUNTAIN VIEW, California – August 14, 2014 – Samsung Electronics Co., Ltd. today announced that it has entered into an agreement to acquire SmartThings, the leading open platform for the smart home and the consumer Internet of Things. SmartThings supports an open and growing ecosystem of developers, who are producing new types of connected devices and unique apps in the cloud that change how everyday objects work. With Samsung’s resources and support, SmartThings will be able to expand its platform and become available for even more partners and devices. Verizon seems set to re-enter the smart home market as news emerges of a new gateway product that supports Zigbee, Z-Wave and WiFi. What it offers by way of a value proposition and business model remains to be seen. AT&T plans to license its Digital Home platform to Telefonica and it seems that devices are part of the deal. AT&T is announcing Monday that European carrier Telefonica has agreed to start selling AT&T’s home automation and security service outside the United States. In general, AT&T seeks an up-front payment, a one-time per-customer royalty and a cut of the ongoing service revenue, though its deals will vary. “They are licensing a good portion of the overall platform and devices from us,” Lurie said. In an extension of it's on-home platform, AT&T has announced trials of an assisted living service within its Digital Life business unit. The commercial opportunity is motivated by sizable following demographic and addressable revenue possibilities. According to AT&T, "for the next 20 years, 10,000 Americans will turn 65 each day. Annual assisted living costs are projected to start at $50,000 a year in 2015. Today, 25% of adults are caregivers to elderly or disabled persons". US Cellular partners with Alarm.com to enter the market for home automation services. Three plans are offered with up-front fees and a monthly commitment of $30/$40/$50 per month with a 2-year commitment. LG, Samsung and SK Telecom announced they are collaborating over the delivery of smart home services. SK already has a smart home platform, which it launched back in May. The main feature of this move is to make that platform instantly compatible with IoT devices being produced by LG and Samsung. i) Retailers and service providers can more quickly and easily add to their portfolios of connected products, increasing consumers’ choices. ii) Manufacturers of connected products can expand their distribution channels to include additional retailers or service providers. iii)Zonoff will hold down its operational support costs and expand its clients’ ecosystem options without having to certify each connected device individually. iv) Ayla will be able to open up more channels for its manufacturer customers without additional cost to the manufacturers. v) Consumers will have more options for interconnecting connected products from different manufacturers and through more retailers. Another example of a (shared) platform innovator strategy. China’s TCL Group is unveiling three new smart products, built using Ayla Networks’ Internet of Things (IoT) platform which provides comprehensive device, cloud and mobile app connectivity for any kind of product. Ayla allows manufacturers to get secure, reliable connected products to market with minimal time, cost and effort—and to improve multiple aspects of their business based on the real-world knowledge gained from data generated by the connected devices. The new TCL products use Ayla’s over-the-air (OTA) communications services to allow remote upgrading of firmware after the products have been installed at customer sites. In addition, the products have a 24-hour timing function and are able to push information to end users’ mobile applications, with the ability to match the language of each user’s mobile phone. Deutsche Telekom partners with KPN to offer its Qivicon connected-home ecosystem platform in the Netherlands. Zonoff, a home-automation startup closed its doors as the plan to sell the company to Honeywell in a rumored $40M deal did not materialize. "We are merging our teams and technology with Prodea a developer of carrier-grade IoT services being deployed by government agencies, healthcare providers, and service providers such as telcos, utilities, and cable operators across four continents. Our combined companies are creating a carrier-grade IoT services platform that delivers a private-label managed IoT services to public and private sector organizations who want to use IoT as a tool for digital transformation".